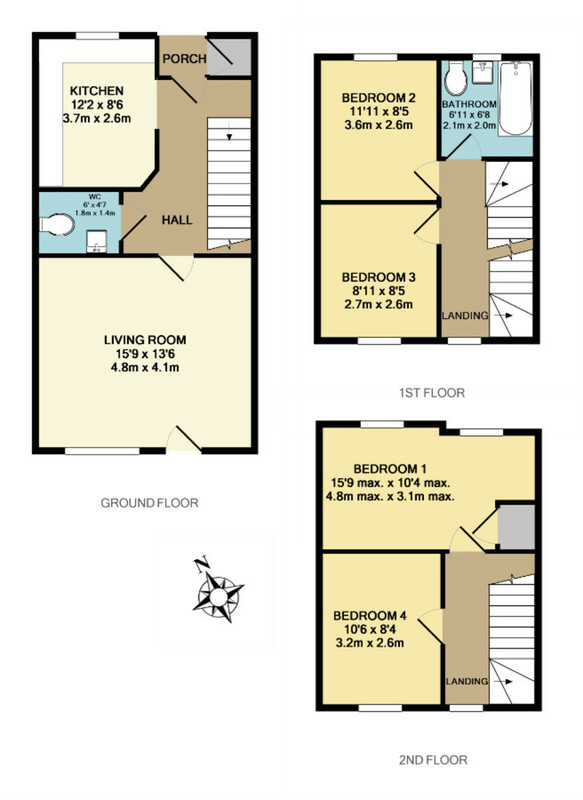 SPACIOUS RECEPTIION HALL Stairs to first floor with built in storage cupboard beneath, laminate flooring, cloak hanging space, central heating thermostat, electric wall mounted consumer unit, radiator. CLOAKROOM Wide doorway built for wheelchair access with allocated area within the accommodation to install a lift if necessary; a white suite comprising a low level WC, wash hand basin with splash back tiling, extractor fan, radiator. KITCHEN Comprising a range of high and low level units with dark round edged work surfaces with white splash back tiling, integrated double oven and four ring gas hob with concealed extractor hood over, inset single sink, plumbing and space for washing machine and dishwasher, wall mounted Baxi combination boiler, window to front aspect, inset spotlights, extractor fan, radiator. LOUNGE/DINER Laminate flooring, half glazed door to rear garden and window to rear aspect, television aerial, two radiators, two light fittings. GALLERIED LANDING Window to rear aspect, radiator, stairs to second floor. BEDROOM 2 Window to front aspect, radiator. BEDROOM 3 Window to rear aspect, radiator. FAMILY BATHROOM A white suite comprising panelled bath with mains shower unit over, low level WC, pedestal wash hand basin, white splash back tiles, frosted window to front aspect, extractor fan, shaver socket, radiator. GALLERIED LANDING Loft access to roof space with light fitting, window to rear aspect. BEROOM 1 Including built in shelved airing cupboard housing the hot water cylinder, two windows to front aspect, radiator. BEDROOM 4 Window to rear aspect, radiator. OUTSIDE A shallow open frontage with block brick pathway to main entrance door. A fully enclosed REAR GARDEN measuring about 13.27m (43' 6") by 5.02 m (16' 6") with a paved patio and pathway separating two areas of lawn and shrubs with a timber garden shed and rear gated access, outdoor light fitting.